The nascence of recreational rebreathers was just waiting to happen. Spurred on by rapid advances in technical diving, new materials and technology, coupled with cost reductions, the allure of long and quiet dives, with vastly improved non-deco times, had to seep from the technical communities to recreational diving, leading to the design of a new generation of closed circuit rebreathers aimed primarily at recreational divers. But how far have we come to making closed circuit rebreathers a common sight along our shorelines? Coming up first on the agenda was taking a closer look at the innards and getting familiar with all the components and how they came together. Looking at the unit as it was laid out gutted on the table, it struck me how compact everything was. The breathing hoses, for example, of which there are four short identical ones, are each just about a foot long. The counterlungs, which detach easily for rinsing, just looked liked a couple of small bladders, but as the manual states, they are “sized to be about half the volume of a full breath for an average individual”, and as I should learn later taking it in the water, they had indeed all the volume necessary. On assembling the unit, nothing felt flimsy or inaccurate; build quality seemed solid, the manufacturing precise, and the design came across as thought through. Not that I expected otherwise, as the SE7EN is the improved younger sibling of the MkVI, which already had many years of development, debugging and refinement behind it. It showed in the details and nice finish. Once the unit had been assembled and checked, it could be fired up. During start-up, the unit automatically performed a sequence of system checks, the progress of which could be followed on the handset. It was all fairly straightforward. I won’t delve too deeply into the technical specs or the philosophies underlying the design other than to point out that the Poseidon series of rebreathers, in constrast to most other CCR’s currently on the market, was conceived as a clean-slate design aimed primarily at the recreational divers from the onset as opposed to a paring down of a pre-existing technical rebreather as a number of other manufacturers have opted to do. In what has been probably the most radical deviation from the prevailing dogma, Poseidon’s engineers opted to use only one oxygen sensor—rather than the usual set of three coupled with a voting logic—to monitor the gas in the breathing loop. There is a second sensor but this is used, in what Poseidon has dubbed “Active Sensor Validation”, only to validate the first and primary sensor raising the alarm if there is a discrepancy in the readings between the two. As the sensor has direct access to both oxygen and the diluent (i.e. air)—each of which has a known oxygen content—a burst of each of these pure gases will provide a set of data points that can be used to accurately calibrate the primary sensor. As counter intuitive as it may seem that a system using only one main sensor can be less prone to error than a design that rests on three, the principle does rest on a sound mathematical foundation, as i.e. Nigel Jones, principal at RMB Consulting, demonstrated at Rebreather Forum 3. Leaving any further elaborations of this side of the matter to the geeks, what is the significance of all this to the user? It makes for a system that is both capable of precisely calibrating itself, using only a very small volume of gas, without any user input and able to continually monitor sensor performance at depth. As such this design allows for a significant level of automation and reduction of user task load. Having been originally trained on a technical rebreather, it even came as a relief to me. I would almost compare to the difference of driving a vehicle with a double clutch manual gearbox to one with automatic transmission and cruise control. While rebreathers, also the latest recreational and most automated models, still require a good deal more preparation and diligence when assembling and pre-dive testing the units; the ease of use and reduced task loading felt both more reassuring and safer —a statement that will probably leave me open to flak from the old-school fraction in the CCR-community, but so be it. High levels of automation don’t, however, imply that you are now freed up to go dive more or less mindlessly. Lessening the task and stress loads primarily translates directly into safer diving, and it also means that I can enjoy my subsurface adventures to higher degree, focus on the experience and possibly other tasks, such as photography, which is my main interest and primary cause for diving a CCR. As with most other courses, training on the SE7EN takes you through the familiar sequence of theory, with an exam at the end, followed by practice sessions in confined water before moving on to open water lessons. In all rebreather diving, using and adhering to checklists becomes a mantra and instilling this mindset permeates the whole course. As tedious as it may seem, it is for good reason such lists are slavishly followed by pilots, highly trained and experienced as they may be. Open circuit gear can more or less be donned and dived after a few and simple tests. Rebreathers not so. Since something as banale as a dislodged or pinched o-ring may not only compromise your dive but put your life at risk, you would want to go over your kit at least as patiently and meticulously as when you assemble that fancy camera housing of yours. Consequently, diving rebreathers is not for the impatient. But what is the hurry anyway? Going methodically through the checklists both when assembling the unit and doing the pre-dive checks is of the essence and, in fact, a mindset that all rebreather divers are required to adopt. Students are repeatedly grilled about this aspect and the question will pop up at the exam! During the in-water training, the primary focus was on buoyancy control, which has to be managed somewhat differently than on open circuit, and on bailout procedures. On a rebreather one cannot, for example, use a deep breath to slow down a descent or use lung volume to fine tune a hover since the combined volume of the breathing loop and the diver’s airways and lungs remains constant. Thus deep exhalations or inhalations make no difference to buoyancy, a habit which many open circuit divers being trained on closed circuit often struggle to break. Other old habits that die hard but must be killed off include frequent mask clearing and exhaling through the nose, both of which are practices that waste gas, counter to the main point of using a rebreather in the first place. In order to manage buoyancy on a rebreather correctly, the diver must acquire and maintain what is called minimum loop volume. As the attentive reader will have guessed already, that is the amount of gas that just allows for a full inhalation. One should feel just a slight tad of resistance at the top of a deep inhalation. If there is too little gas in the loop, an automatic diluent valve (ADV) should open and add some more. If there is too much gas in the loop from the onset—as is usually the case—this excess needs to be vented. This is accomplished by a simple procedure. First, the diver keeps partially exhaling through the nose releasing bubbles around the mask until this sweet spot is acquired. Then, the diver leans onto the left side causing the overpressure relief valve on the right counter lung to open and vent. While in this position, the valve is then slowly tightened until the bubble stream stops, pretty much as one would adjust the shoulder valve on a drysuit. This little exercise usually take some repetitions to get right, but just as well, as it is part of the standard procedures when diving the unit henceforth. When in doubt, bail out! Bailing out means going from closed to open circuit and is arguably the most basic and elementary procedure trained on both technical (type t) and recreational (type r) rebreathers. It is essential that performing this procedure becomes second nature and routinely practiced. “When in doubt, bail out” for whatever reason, no questions asked. It applies not only to obvious cases, such as equipment malfunction, but any dodgy feelings or nagging suspicions also qualify. On a rebreather, having a gas to breathe is not the only concern. Knowing what gas you breathe at any given time is also important. So if you are not sure, better be safe than sorry and switch to open circuit. One of the aspects that sets recreational rebreathers apart from their technical dittos is a requirement to come pre-equipped with a Bail Out Valve (BOV). Basically, it is just a fancy expression for the open circuit regulator, which has been mounted onto or integrated with closed circuit in such a manner that the diver can switch forth and back from one circuit to the other, without having to remove the mouthpiece. On some rebreather models, such as AP Diving’s Inspiration range for example, this switch is accomplished by twisting and turning the whole mouthpiece 90° with respect to the breathing hose. The SE7EN, on the other hand, has this big lever on the mouthpiece housing. Since this design enables switching using only one hand and without having to let go of i.e. a camera or a downline, I like this better. When the lever is in a vertical position, the closed loop is open (mind you, there is some confusing jargon to observe there), and when it is flipped horizontally and pointing forward and away from the diver, the closed loop is closed, with breathing done off the open circuit from a regulator exhaling bubbles into the water. During bail-out, the open system draws breathing gas from the diluent tank via a first stage as in any open circuit configuration. Only snag here in this otherwise nice idea is that the said diluent tank only contains a volume of two or three liters, the same as a small pony-bottle. So even when the tank is still close to full, there is only a quite limited amount of gas available for a safe ascent, and if any significant amounts of gas have been lost due to sloppy technique, matters may even get outright dicey if bailout is required on a deeper dive. For the same reason, it is a requirement that an additional bailout tank with a regulator must be carried for dives below 18m (60ft) i.e. in the form of a side-mounted tank clasped onto the diver’s left side. 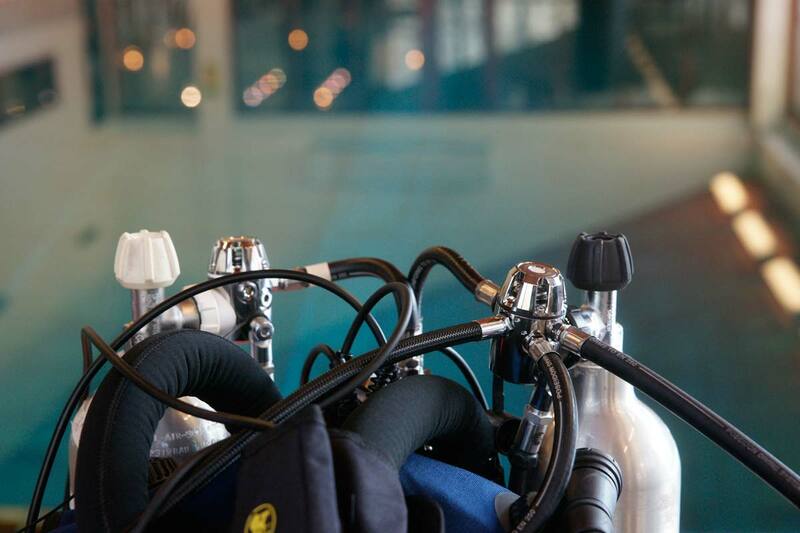 For the Advanced Rebreather Diver course, it is therefore also a requisite to practice bailing out and surfacing while breathing from this separate tank. This procedure entails closing the loop, a switch to breathing off the bailout tank while being able to maintain correct buoyancy on the ascent. To avoid blowing up and shooting to the surface in an uncontrolled ascent—this is where the minimum loop volume procedure comes in real handy; with the overpressure valves set correctly on the counter-lung as well as the drysuit I had to wear, I just ‘wriggled’ my way up to the surface in a controlled and orderly manner. Barrel rolling onto my right side, the drysuit valve on my left overarm would vent, and by rolling left, the valve on the right counter-lung would vent. Rock and roll does the trick. Having only gone through a course with some pool-dives and a day of open water dives, this report can only be a reflection of some first impressions and preliminary observations. So while an indepth test where we will take the Se7en thoroughly through its paces is in the works, what can we conclude on the current basis? Being trained on the SE7EN was a novel but straightforward experience and the machine was always compliant, comfortable and easy to operate in water. Its compactness and snug fit made it easy to dive, and in terms of weight, resistance through water and freedom of movement. it was just as good as my regular open circuit rig. In particular, I fancied the flat and compact assembly of the mouthpiece and BOV, which did not get in the way of getting my eye close enough to the camera. 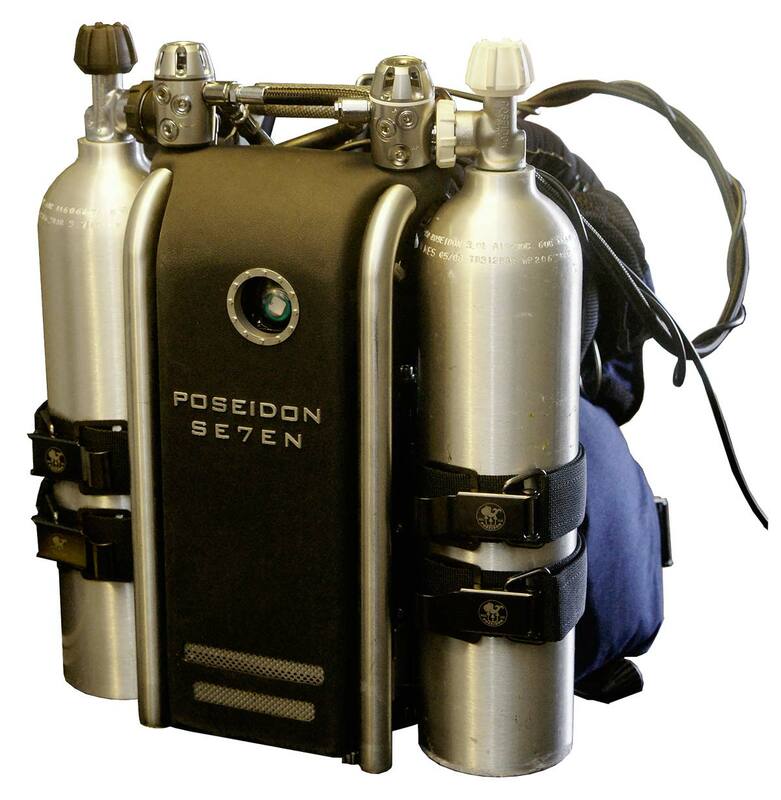 Holding the Se7en to its apparent design criteria, being primarily designed with recreational rather than technical divers in mind and to let technology do as much monitoring and control as possible, Poseidon has clearly taken huge strides towards eventually making rebreathers somewhat mainstream, or at least not reserved to a privileged few. I liked its relative ease of use, which however, must not be confused with simplicity, as it clearly packs a lot of technology under the bonnet. Existing rebreather users crossing over to the Se7en may initially not find themselves immediately at ease with not having their usual sort of diagnostic information displayed, such as having the PO2 readings for three sensors read out and just having dive information displayed along with system integrity. But all others I trust will find the display and operation logical and straightforward. Put technology to good use, I say, like in cars, where I don’t really know or worry about oil temperature either. Type-r rebreathers are required to use prepackaged scrubber cartridges, and if there is a possible Achilles’ heel, this may be it. The rules stipulate they only have a lifespan of maximum 24 hours once the seal of the packaging has been broken, or maximimum three hours of diving, whatever comes first. While I initially had to overcome the reluctance to discard the cartridges every night, even when they have only been used very little and otherwise seemed good for another dive or two, I conceded the expenditure was not a major issue. When bought in bulk, such as in 8-packs, current list prices on the web as this article goes to press are about €30 / $25 / £20 pr. cartridge, which is comparable to the price of air or nitrox fills for the same amount of provided dive time. While a stash of such canisters can surely be stored in an attic or garage, the sticky bit comes when taking the unit on a trip when each cartridge weighs 2.7kg. As this equates to 16 extra kg to carry just for six days of diving, you are either limited to going with operators who stock these cartridges on location, or bite the bullet, pay the extra luggage fee and haul the whole load along. In all fairness, all makes of rebreathers are somewhat hampered with such issues, but thankfully still more operators are becoming rebreather-friendly and capable of servicing the growing community of recreational rebreather dives so cartridges should just be yet another consumable to be purchased on location. Poseidon is also addressing the growing issues of luggage restrictions and fees on airlines in other ways; the company is setting up a network of operators where divers can bring just their personalized battery and can have it plugged right into a rental unit on location. Meanwhile there’s no such issues standing in the way of putting your kit in the trunk of your own car and driving off for a leisurely Sunday dive, doing some macro-photography somewhere up the coast. And did I mention it is not a bad looking piece of kit either?